July is when the fireworks explode in glory! Can you even believe it is July??? I sure can't! I looked at the date on my computer, and it hit me! I had no clue today was July! So, I get to be first- please? Happy July! And happy of all happies, it's going to be sunny out for a while! Yay! I'll be putting up Stan's column, soon. I'll link you to it, now. I haven't even read it myself, yet! That's always a bonus at the first of the month. We'll read it together! Click here! I've been a bit under the weather, lately. I've had a headache and stomach ickies all week. I wonder what's up with that. I hope it gets better, soon. I'm so sick of being sick, but I guess it's just the way it is. I've learned to live with it. I'm so tired. I can barely walk back from my evening walk on the river, lately. With all of the wonderful things to eat, you'd think I'd be feeling great! Strawberries! Blueberries! Nectarines! Fresh spinach and lettuces in the garden and to top it off, Bill caught a beautiful summer steelhead, and --get this! Where did he catch it? Mind you, we have two (I've counted them) summer steelhead in the Kilchis. Alright, so I'm kidding, but there are very few, and what we have are strays. It isn't planted, anymore. Here is a thread on his catch, and below, a picture! So, last night I made a spinach salad with fresh raspberries, poppy seed dressing, walnuts and raspberries, (Yum!) and I cooked the steelhead, rubbed with fresh herbs, and laid on a rock salt bed, on the Traeger. 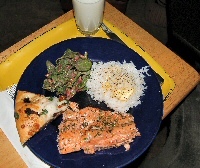 By Andrew's prompt, I used a Wildwood recipe I cooked a mix of wild and white rice. Oh! I got my fresh herbs from my garden! Basil, thyme, oregano, parsley, chives, whatever I could cut up, and rubbed them into the salmon along with some fennel seeds, salt and pepper. Yum! Then I made a hollandaise sauce and well... died and went to food heaven! Before I chopped up the herbs, I knocked on Andrew's door and did a smell test on them all. I held up a leaf of basil. "What's this?" And on and on, till I was done with my proud array of herbs! That was fun! They smell so good! Every morning I wake and go sit out on the deck with a fresh, steaming cup of Peet's coffee. I listen to the beautiful sound of Spring birds. There is one bird, I don't know what it is--that has the most hauntingly beautiful song. It echoes as it cascades an arpeggio down the scale. It moves me, almost to tears, how beautiful it is in the early morning light. It happens again at dusk. These are sounds that we try to imitate with musical instruments, but never quite accomplish. 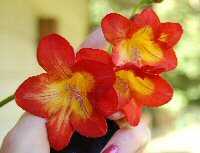 After the caffeine starts to work on me, I slip on my boots over my cold morning toes, and check on my freesia. The rubber of the boots scrapes against my legs as I walk. Cold dew from the grass splashes up my legs, but I can't wait to see progress! Darnit, if my freesia aren't being troublesome this year. I have a few (hundred! ), but for the several I bought, (thousand!--O.K., I overloaded this year!) they aren't producing up to my expectation. I wait, and wait.... will they sprout? Please, more! More! Encore! Then, it's on to anxiously watching the berry crops ripen. They are my second favorite. Do I have new strawberries? I have little tiny ones here... and great big ones, over there! Sometimes I'll wait and wait for a couple big ones to be ripe so that I can have them on my cereal. They are huge, and I can cut them like a steak! "One more day!" I tell myself... and then the next day, it's either eaten by a bird, or rotted out on the underside. Dang! Sometimes patience does not pay! 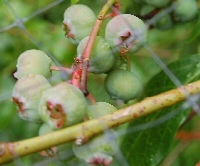 The blueberries are thick on the bush this year! Oh, my! Fresh blueberry pancakes soon! Muffins! Berries, frozen on the cookie sheet, to put up for surprise treats on winter mornings! I have netted them in, so the birds will not get them before I do! And raspberries? Let me tell you my story, my history with raspberries. I have tried to grow my own raspberries since I left home as an 18 year old teenager! My Mother and I picked raspberries together since I was a small child. We have family heirloom recipes and she made jams, jellies and wonderful desserts! I just have a deep fondness for raspberries! They are home to me! When I got married, my husband and I planted raspberries. I was so excited! But, just as they were getting ready to be real crops, and we hadn't ever had any actual fruit, yet, he left our family. I remember sadly, taking him by the hand and leading him around our property, showing him all that we had, together. Where Andrew and David used to play in the shed as a toddler, where we cooked marshmallows over the burn barrel, our garden, our chickens, and I held his hand close, and begged him not to leave his family. I stood by the raspberries and said, "And Jeff, here are our raspberries!! You don't want to leave our raspberries, do you?!" I had to move, also. It was with deep grief that I left our raspberries. 10 years into the future, Bill and I planted raspberries. I did so, hesitantly, trying to hold back my excitement! I was wondering if bad luck might follow after planting the raspberries. In a way, it did! I've had raspberries plants for four seasons, now. We had yet to have fruit, until this year! The first year, the deer ate them, so we built a waist high fence. The second year, the deer ate them, so we built a head high fence! Bill just shook his head. I don't think he understood why these berries were so important to me. And then, the third year we pruned them wrong, so we didn't have but maybe 10 (count them!) berries. THIS YEAR, we have raspberries and I still live here! We did not prune them at all, for fear of whatever we did wrong last year! They are a wild bramble of cascading branches, filled with little tiny raspberries! They aren't the big, juicy-sweet full kind that my Mother grew, and I don't know why that is, but I'll take them, nonetheless! They are such a treat! Raspberries are just so good. I don't know how God makes all this neat stuff! I often think of that day, walking around the field, showing my ex all the things that he was leaving. That was a very sad day for me. I really thought I had him convinced, but the next morning, he packed his bags and left. The other day he drove in the driveway to pick up the children. I had been on my way out there to pick, as he drove up. Without thinking, I said to Andrew, "Roo! Did you know we have raspberries to pick?" as he got into his Father's car. After I said that, I continued my progress towards the garden and the whole history of raspberries hit me. I wondered to myself if my ex remembered that scenario at all. If he recalled my holding his hand so many years ago, and trying to convince him not to leave the growing crop of raspberries. Oh, the tears that I cried. The grief that I felt was unbelievable. I did not think I'd ever get past those hard years. I can't believe that I had to play the piano at the same business that he and his new girlfriend worked at, just to pay my bills. How did I ever do that?! I did it, simply because I had to! And how, now, people ask... do I live with my health problems? I have no choice, but I cannot believe the blessings in my life! They overflow and make my challenges so small, in comparison! As I think back to it, now, I see that the hard lessons I needed to learn through it all, have been a strong and very real blessing for me. Growing hurts! I am a better, stronger person, now, through any battles that I have faced. I look at other people's battles and find mine easy in comparison. I am Thankful. and Oh, I am blessed! How many gifts I have been given! I walk in the morning and I'm just in awe! And on this beautiful sunny day, I have raspberries, and sunshine and a smile on my face. Thank you, Heavenly Father, for the wonderful blessings that you have bestowed on me. I don't deserve the wonderful things that surround me. The river that flows, forever, so close by my side. The long and wonderful life You have given me, the children that You have made me responsible for. Father, thank you dearly for my raspberries. And to every one of you, Happy July! Now... I'll get to Stan's column! I would love to wish you a very Happy Independence Day! Let's head on over to the Birdsnest. Where's Waldo? It's exciting to keep up on Bill's travels! Bill Monroe is now keeping a blog, and it's fun to keep up! No longer do we have to wait through the week for his columns on paper. You just never know when he will have something new, and he's doing a great job of keeping up! Click here to check it out, yourself! If you lose track of it, you'll always be able to find a link over to the right, there, under Featured Pages. There will also be a link on the discussion board, but it will be a couple days until I have the time to change our template. Anyhow, it's bbq day, and what a gorgeous sunny day, it is! I hope you have a wonderful day with your family! I shook it off. There just isn't time in life to feel sorry for yourself. There is just too much good to enjoy. Life is short, don't waste it! Regardless, a fleeting sorrow washed over me as I walked along the river, fly rod in hand. It hit me that I miss having small children around. I miss sparklers with the kids. Where is the excitement? Do I have to grow up, now, and celebrate the real meaning of Independence Day? Is it no longer about sparklers and flag cakes decorated with summer berries, and loading up in the car to go see fireworks? Yep. I could have a brief little pity party. Instead, I tried to block it out and cast a perfect long cast over to the rocks. My fly bounced off the rock and landed softly, naturally on the water. Perfect! It just like a real bug out of the tree, overhead. GULP! An eleven inch cutthroat gobbled it all up and made me giggle. Bill and I spent the morning on the river enjoying our own sort of fireworks. We had gone down into tidewater to explore and to watch cutthroat trout attack our offering. They splashed on the water's surface, leapt in free spirit, and caused me to giggle and scream. "Oh, Bill! Look at this one!" A fine, 14 inch resident fatty glommed on and didn't let go. It wasn't a nibble-nibble, but one of those fast, hard shocker pulls. I love that! It was such a beautiful day. The water was crystal clear and we could watch the cutts swimming in schools back and fourth as we spooked them out of their 'hidy-places'. The water was low and so clear! On an outgoing tide, their is little salt to dim the clarity. Andrew called from Portland at about 9:00 PM. He was all happy, riding in a car with his friends, heading down to the riverfront to see the fireworks. I'm really glad he was having fun. Andrew seems to be seriously making up for lost social time. A new friend a day- a new adventure. David and Bill and I had a wonderful dinner. Steak, baked potatoes, corn on the cob... all the things that make a great BBQ. It was quiet. We all sat on the couch and watched the news as we ate. There was no hurry, no excitement, no anticipation of the night's activities, later. As darkness washed over the sky I walked out onto the deck and looked towards the beach. Sure enough, the sky softly rumbled from a distance. Lights flashed, even from 5 miles away! I saw sparkles barely cresting the ridge of mountains that hover like giants, surrounding our valley. "There are little kids out there on that beach." I thought to myself. On a warm, summer night, they hold fast their parents hands, and look up to the sky with awesome wonder in their eyes. I've seen it! I know. I've done that. Oh, how I miss that! Still, I can't complain. I have done that! I'll carry that joy and memory in my heart, forever. I went down and hugged David and said good night and then went upstairs, snuggled into my overstuffed bed with high count light cotton sheets. They tickled my chin. They felt so clean and good against my skin. It's all good, you know. It really is. I snuggled in, deeper. Funny, but if I had small children right now, if it were all reversed, I'd probably have sticky syrup all over my hands or the toys would be all over the floor. I'd stop short, sit on the couch and sigh... thinking about the good old days that I used to spend fishing in tidewater, and casually, freely strolling along the Kilchis river, fly rod in hand. I'd probably miss the freedom that I now own. I'd feel lost without those days that the dogs ran by my side, and the sun's warm rays played on the bare skin on my back, and where I had time on my hands. The warm slow wind rustling through the ripening blackberries, the sound of an eagle's call, the quiet song of the river. I think probably that the real problem is (if there is one!) that each and every stage of life is just so amazingly darn good! Hold it tight, while it happens! Each and every stage, I remember with such fondness, and I forget any downsides. I think it's just human nature, right? Man oh man... I've had such an awesome life. I'm really thankful for that. So much so, that I could use a little David, or a miniature Andrew around to share it with. That way, the parents could deal with the sticky syrup of pancakes and I could just play sparklers with them on the Fourth of July!! Oh, that sounds just great! It seems life just keeps getting better! Oh! I have to go check my freesias! I'm beside myself with excitement to go to Las Vegas and the ICAST show! I haven't traveled for a while, and I'm looking forward to this as if it were a vacation! I am busy, dreaming around and clicking on things that I can't afford to do there, but wish we could. Magic shows, comedy shows, expensive dinners, like at Emerils or Spago! Whooo hoooo! Wouldn't that be fun? I'm not much of a gambler, but I do a little. Maybe I'll hit the big one. I'll never forget winning 1800 and telling the kids, "We can eat ANYWHERE you like! Just name it!" Their choice? The In and Out Burger! It was great! I put that money in a bank bag and locked it up at the front desk. I left with it, too! The funny thing is, I barely gamble and Ruth doesn't at all. We both have a beer or a glass of wine occasionally, but we don't party it up. We both enjoy cool weather and the Oregon Coast, and where is ICAST? The desert! I enjoy the peaceful ocean and the music of a coastal river, and where am I going? That's right! The city! I know full well that by the time my plane lands in good ol' PDX, I'll be glad to touch down. I'll be even more joyous to drive into my driveway and walk down to the river with my waggly tailed dogs. And the lasting result will be that distance, indeed, makes the heart grow fonder. That is, if fonder is indeed, a possibility! I do love the river! I do love my home! Now I don't know what I'm more excited for, going to Vegas, or coming home! Life has been good, lately. I feel good, normal, like a real person! My heart is beating strong, I'm not weak like I have been, and I can make it all the way to the river and back without stopping to rest! I do hope that this energy sustains! Can you even believe I made the top 25 most influential again, this year? I can't! Somehow I just don't see myself as influential. But, if they say so, I do get a kick and a smile out of it! I don't know what's up with me! When I used to travel alot, I could be ready on a dime. (Not only that, I could stop and pick up the dime! Muhahah.) I mean, I was packed and ready to go in minutes. That was back in the day. Now? I have medicine and blood testers and oh no! It is the law that you can't just put your meds in a pill box. You have to have all the prescriptions, too. If I were smart, I would have stopped by the pharmacy for a list. But, no! I have all the bulky bottles! My INR is way off! It's almost 6! I have to test it again, today. Man, why can't I stay normal with this? I adore standing in the garden and filling my face with raspberries and strawberries and eating spinach right off the plant. That's why! I have no control! Eat a regular diet? Yeah, right! It took me all of yesterday to figure it out. "Write everything down." Bill said. I held up my ruffled paged notebook and showed him. "I've been carrying this around for days, Bill!" It's been little help. I still can't get it all together. Will I need another shirt? Have I packed too much? Too little? Who will help me carry this thing? I can't lift more than 10 pounds, and let me tell you, even on wheels, this thing is more than I can handle. My Mother had an old steamer trunk. I joked to Ruth that I was going to take that. "Can you lift it for me?" She refused. Do we need two laptops? I suppose we do. Am I going casual? No, because I have a meeting to attend. That throws a hitch in 115 degree heat. All I have are wool business coats. I keep thinking it would be best just to wear my dry waders. At least they'd know who I was. Who would know Jennie the fisher girl in a business coat? On top of everything, I have bruises all over, due to my thinned blood. Nothing is normal with my new, post dissection body. Things don't heal. I have a silly splinter in my finger that's been there for 2 weeks. Now it's all swollen and red! Sheesh! It's a splinter! Heal, already! Jennie-- don't forget to get your legs waxed. As Ruth says, sometimes we need an environmental impact statement to harvest old growth. That's me! And I can't shave, due to my high INR! Uh oh! I'm stressed, so what the heck am I doing writing on ifish? I have to go! Ruth and I have a lovely deck outside of our room at the Las Vegas Hilton. Last night I was tempted to sleep out there. It was so pleasant, that I stretched out like a cat in the sun. It's too hot in the daytime, but the evenings are luxury. The air conditioned air is almost too chilly when the sun goes down. I miss the warm summer evenings like I had when I lived in Canby. At the coast, it's nearly always much too cold to enjoy the out of doors, at night. The New Products Showcase at ICAST was so far the highlight of our stay. We always enjoy lurking over the new toys for fishermen and women. I visited with Jim Martin for a while, and he pretty much wrapped it up for me, stating that every year it's like taking a peek into Santa's workshop! I don't think I'll ever forget that colorful description. It indeed, is! He was actually referring to the work done by Berkley at Pure Fishing and let me tell you, they have been busy little elves! I can't wait to get back to show you the interesting things I've learned. Buzz took me through the booth and picked out several items of my interest. He's got me all excited about trout fishing again, and boy oh boy, do I have a list for Santa, this coming Christmas! New rods, new Gulp products, new line! My stocking should be full to overflowing if I am a good enough little girl! I met with Stan Fagerstrom yesterday at lunch. That in itself would have been worth my while to fly down here. He held my hand tight at the end of the lunch, and at that very moment, I'd have rather been in no other place. I adore that man! As usual, he began our feast with Thanksgiving to our Father above. I always feel so safe when I'm with Stan. Home is where the heart is, and my heart is filled with the love and safety of my Heavenly Father when I'm with Stan. He's an angel. That's for sure! Ruth and I have been a giggling duo since we arrived, here. So much to do! So much to see, and darnit, so much to eat! Las Vegas is the home of extravagant excess. We love to people watch! Well, it's off to another day. I've been so busy, I hadn't even a chance to look over ifish. I believe this is the first time, while being well, that I've not kept up with ifish daily in I don't know how many years. I'm back, refreshed, but still on the road. Next, if I'm brave enough, and if I am full to overflowing with coffee, I may attack my e mail. I'm sure it's also an example of extravagant excess! Maybe I'll break it up into little bits-- 100 at a time. I'm going downstairs to get my most favorite thing in Las Vegas. Fresh, Naked Orange Juice. It is something I adore, every time I'm here. You can't get it in Oregon at all, due to the fact that it is very fresh and perishable. Well, have a great day. I'll be home soon, Kilchis. (If you are reading this!) If not, Bill? Give him a big hug for me. I'll be home before you know it! Ifishstock is the next order of business. Pheh! It's one thing after another, but I'm excited and it's fun to have something to look forward to! I do hope you can attend. I just love putting names to e mails, monikers, boat names, real names! Will you attend? Please vote in the poll, if you are. It's a great time to meet all the ifishers, win some fun prizes and eat way too much food. Hey! Along with all of that, why not do a little fishing at B-10, too? Hire a guide, or go on a charter, or do your own thing with your own boat, and then drive over and show it off to us, later? I have so much to catch up on, but I just wanted to mention how lovely it is to sit here in the quiet and to listen to my hummingbirds hum, outside the window. Las Vegas is incredibly noisy. I had that pointed out to me, yesterday and although I hadn't thought of it, all of the sudden, then, I heard everything and it drove me crazy. too! Anyhow, the rain is softly falling and it's a perfect backdrop to dig in and try to get some of my work done. Have a great day! I'll tell you all about the coming products, in the next week, and hopefully, into the coming weeks, too! There is so much to learn! I am just dragging, trying to catch up on sleep, etc. My feet still feel like they are burning on 112 degree hot pavement and I just can't seem to feel awake. It's like jet lag without the long trip! Anyhow, I will catch up. I will! I had a Voc Rehab appointment this morning and now have a doctor's appointment. I also have a very exciting appointment to meet with Ron M from the board. He offered us a tuna loin. What fun! The boys will think I'm their hero. They love the stuff, and have a great time with the Traeger and some hot spices, crankin' it up a notch. I'll just lay on the couch while they both go to work for dinner. I hope they throw me some scraps. I'm so anxious to get with it and back into the cast of things. However, I have to take care of me first, and man... that's frustrating sometimes. I finally gave in to exhaustion, yesterday and went to bed. After seeing the doc, I slept all afternoon and clear till morning. I feel like screaming at myself, "Aren't you ever well?" My refrigerator is a strong reminder of how I am, and that just makes it even worse. Every time I open it, I see mounds of fresh halibut, uncracked fresh crab, bagged tuna loins, and filets of deep red salmon. Bill has been busy on the ocean! He's been twice, lately. I have not been at all. Shall I rename this column, "Bill's fishing life?" I feel like the little piggy that went "Wee wee wee... all the way home!" It is frustrating. Imagine living with a wimp that gets sick every time you turn around. Then, imagine that wimp is you! Oh, it's frustrating! And I have to live with me! Imagine an e mail program full of unanswered e mails! I trudge through them, and try so hard to answer each one. Yesterday, I fully failed! I have a silly sliver in my finger. A sliver! A silly little rose thorn or something. And what do they usually do? How does our body normally react? It swells up and then pops out. All better! RIGHT? That's always the way it's been for me, until my heart surgery. Until coumadin. Until...whatever it is that makes me different, now. It seems everything is difficult. My finger is swollen to twice the size of a normal finger, red-hot, angry and infected. A sliver! It's been in there and bothering me for over a month. It's time to get it taken care of. Yep, my temperature of 102 tells me that. We just hope that it doesn't infect my valve in my heart. There are red streaks coming from it, and it scares me. I certainly don't want my heart valve looking like a chia pet. I remember that one time I heard someone say that if they knew their life was terminal, (what does 'terminal' mean, really? We are all terminal!) that they'd travel, go on fishing vacations, etc. Well, heck yeah! I'd love to! However, when will I be well enough? It's easy to say what you'd do, I guess. Harder, though, to put into action. If I'm sick, how do I do that? I try so hard to be well. I repeat positive affirmations from the moment I wake. I eat well. I sleep long. I exercise. Sure, I have vices, but doesn't everyone? If I didn't, I wouldn't want to live. I love my vices! I was about ready to write in my column that I give up writing this column. It's not 'fishing' enough, anymore! --but heck, no. Sorry 'bout that, but I'm not giving up, yet. 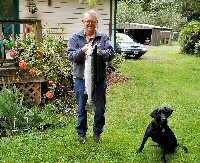 I do occasionally feel silly writing a fishing column that most often is about my dog, about my plants, my garden, my sedentary "sports". I slumped yesterday, exhausted, down on the river in an easy chair, staring into the dark green waters, imagining salmon season, and trying to will myself energy. It didn't work so well. I had to take three breaks, back up to the house. But, I will not give in. Soon, I, too, will be back to Jennie the fishing girl. I will never quit! My lack of good health is frustrating enough for me to constantly try to make change. "It is what it is." That's what my brother says. But it's not permanent! It is going to be different, soon! It is what it is, but we can change what it is! Terminal, I guess, is when you die trying! But, soon... very soon..., my life will be filled with "Fish on!" --just like it used to be! Kilchis had a slight limp on his front left foot for a while before I left for Las Vegas. I watched it, thinking he probably had a sticker in his paw, or something. He gets that, occasionally. When I came home, I was surprised to see that he was unable to bear weight on it, and totally holding it up, and walking/running on three legs. Argh. Not good. I took him to the vet yesterday and they think they found a hairline fracture on his shoulder. Wah. Let's see... Kilchis has never had a broken bone until we got Rev. Now, this is the second in 5 months. The frustrating part is that Bill can watch Rev slam into Kilchis at full speed, shout at him, and then totally deny that this is what is hurting Kilchis. --even when Kilchis does a full flip, due to the collision! Denial? He loves Rev so much. I understand that. I sincerely wish it wasn't Rev causing the damage, but I honestly think that it has to be. The force of Rev hitting me sends me to the ground. I know what that dog is capable of. She's strong and built of solid mass. Kilchis just hovers by me, when we are together on the river and when Rev is on the loose. I don't blame him! Rev is cute and sweet when she is calm, but man, oh man, she has energy and strength and total wilders! I just don't understand why her focus is so on Kilchis, when outside. There are many places to run to, but she focuses on Kilchis and I as if we were bowling pins. Anyhow, it's double duty for Kilchis and I, today. I have to go get an infected sliver removed, and he has to go to the vet, be sedated, and have an x-ray taken. A good one, so they know what we are dealing with. I feel so badly for Kilchis. He's in alot of pain... again. Not only that, but cha ching! If my medical expenses aren't enough, let's try Kilchis! We are only 5 months out of last surgery, and Rev bowls another game. Here we go again. The vet says total rest at the very least. Sigh. The vet was right, I guess. He said this will happen again, if we don't deal with the problem. It has happened. Since there is no way that Kilchis can heal with Rev around, I will need to move somewhere while Kilchis is healing. Getting rid of Rev is just not an option. Bill has been through so many losses this year. I hope that Bill takes this time alone to get Rev trained out of this habit. It could all work, if we all give it our best. It will take a good trainer, working with both Bill and Rev. We'll see. I'm praying! I just hope that in our absence, Rev doesn't build even more dominance. Wish us all luck! They are worried about my INR and bleeding too much during this small surgery, but they are also worried about my valve and infection. It's a darned if they do, and a darned if they don't. All for a silly sliver! Well, off I go! I'm trying to keep Kilchis out of the food and water. That's tough to do as he's spoiled rotten and used to his morning treats! Oh! My freesia is in full bloom! It's so gorgeous and it makes me so happy! I love the smell of it. This year, I have mostly purple, so far. They aren't nearly as fragrant, but still smell yummy. The yellow is the strongest. I'm going to go pick a stem and place it by my desk. Ah... the glorious smell that I get to have, only once a year! There is NOTHING else like it! Pure heaven! Pin one to my collar, too! The kids are busy trying to figure out ways to make money for college, too. It's a family thing! Oh! I caught the most beautiful cutthroat on a yellow reverse spider last night, before bed. The spots on a cutthroat just take me away. I can't help but to stare into them, while I hold the fish gently in the water, to release it. This one was a fat 14 inch resident cutt. So beautiful that it takes my breath away. How on earth does God make such beautiful creatures? An artist above all. Heavenly Father, thank you for what you provide us. Thank you that I am feeling well and healthy, today. Thank you that you have restored my strength to deal with things that I have on my plate. Please be by our side, today, as we ask your guidance and for your powerful healing for both Kilchis and I. Here is how the boys and I cook tuna and it is absolutely to die for. I have died and gone to heaven, I'm just sure. I have never tasted ANYTHING so good in all my life. I have been through Ron M tuna, and now Bob Rees tuna. I am now going to go stand out on the hiway with a sign until I get more. I will work for TUNA! I will carry a cooler with me with ice in it and sit all day dockside until I get my fix. OK, here's the recipe. Listen closely. It's so so so good. 2 fresh loins (enough for three or four people... but we eat tons of it. 2-3 Tablespoons of wasabi depending on how hot you like. A bit of Chinese hot mustard if you like. I like! Place loins in it for 15 minutes. Flip over and set out 15 minutes more. Now, I have a Traeger, but Bill had me preparing for a garage sale all day and I was pooped, so I just got out the old black skillet. Place in skillet 1/3 cup of olive oil and put it on medium heat. It MUST be hot when you put in the tuna. Take a pair of tongs and place the meat quickly in the pan, so it all cooks evenly. I have a huge skillet, but you could do two batches. We still had to! Cook 1-2 minutes, tops. Flip it, and cook 1-2 again for color on the other side. This is the make or break period for me. I love it with a little goo in the middle. You can tell after a short learning period, when it starts to turn to "TOO DONE" That's really sad when that happens, but it's still good enough. But-- if you get it perfect, oh... my............ to die! What I do, is take one test piece and measure the time by taking off little pieces as I time JUST where I like it. Then, cook the rest, just like that, with your timer handy. Oh, yum. Anyone can do this, now! I love recipes where people tell me exactly how to do it! I hope this helps someone! I swear... I thought bacon was good. This is better! Tuna and eggs tomorrow! OK-- Now for the news. Kilchis does NOT have a fractured shoulder. He has a soft tissue injury. I do not have an infection presently, so they just cut the top off of this sliver thingy, and I am fine for now! They said that if it puffs up again to come in immediately and that it has to be actively puffy to do what he needs to do. So, that's all folks. My belly is full of tuna and I'm a very happy girl. I just love Tuna! Man, that's good stuff! The Headlight Herald forgot to put what time our garage sale starts... and now people are showing up left and right! Yikes! It's a wet and soggy Sunday. It's a 'comics at the kitchen table', kind of day. It's so wet. Three days of rain and everything is soggy. Yesterday we had a garage sale and the place was teaming with strangers. It makes today seem all the more quiet. My birds are thrilled that everyone has gone, now. My favorite hummingbird, Claire, sits at her hummingbird feeder. The only thing that moves is an occasional flutter of wings, and her head, bobbing up and down to fill her beak with sweet sugar water. The Momma and Daddy Grosbeak are teaching their baby to feed. I can watch that for hours. To heck with the comics! My raspberries seem to be dissolving right on the branch like a sticky sweet candy cane from last year. The canopy on top of the trees is full to the brim, and drip, drip, dripping to overflowing. I have a bird bath that is just beautiful. People ask how we managed to get the moss to grow on it. We don't know! It is just thick with this deep green, lacy moss, overgrowing it's rim. But when I fill the bowl with water, the moss absorbs it all, so that it only stays full of water for a little while. We checked and checked the cement for leaks, until we finally figured it out! The birds have fun playing in the damp moss, but never quite get a bath. It's their sponge bath, I suppose. It's the best we can do. The river is swollen with rain, and it lures me out to cast a spinner. Sure enough, the first cast brings in a nice, fat resident cutthroat trout. My barbs are cut, so it's very easy to disengage them. Before I do, I can't help but stare into those spots that seem to go deeply, forever. What a magnificent creature. The experience goes from giggles to breathtaking. Then I hold my breath and with one easy flip of the hook, it pops out of the corner of it's mouth. The trout is gone, as if it never happened. That's why I have to do it again. And again. And again. Sundays last forever, you know. Twice as long as forever when it rains. A little trout helps to speed up the afternoon, and creates an appetite for me, so that I have something to do when I get back to the house. I lean down to pick up a shiny agate and the thought hits me. Who will take care of this earth, this river bed, after our generation is gone? It worries me that my sons stay inside so much of the time. They listen to music and play games and seem attached, too attached... to electronics. Do they even know this earth? Did I, at their age? I can't help but believe I did. It goes along with the fact that I walked to school barefoot in three feet of snow and.... You know the story. But, then I realize that my sons are very opinionated and more knowledgeable than I am about current affairs and Andrew especially, is known to protest and boycott companies that aren't "green" to his satisfaction. Perhaps they just attack our world problems from another angle. Who knows? Our way didn't seem to work. Maybe theirs will. Wish them luck. Someone has to save the earth. I can't help but think these things as I stare at the rain in the sky and the water on the rocks. It all creates such a magnificent collage. The colors of the rocks are the colors of the world times 10. The white of the sky creates the most amazing contrast/backdrop to the earthy but brilliant color of rocks beneath my feet. I bend over to touch them. Could they be real? ... and I pick up one that glitters, even though the sun is behind the clouds. Extraordinarily beautiful! It takes my breath away. How does it do that? My dog, Kilchis looks up at me from behind his lovely wet and dripping ears. He, too, is awed by the beauty. I can see it in his eyes. I wish I knew what he knows. I giggled as I stared at him. "You are so wet!" It wasn't just the rain that soaked his skin. Earlier, a cormorant with her young play-acted wounded. She fooled Kilchis into following her. I laughed as Kilchis fell for her trickery. He took chase and leapt off the river bank and into the river where it has been shallow, until the monotonous and continuous rain. He fell deep into the water and went clear under. He struggled back to shore as I picked myself off the ground, from laughing. The cormorant, figuring Kilchis was done with his chase, went back to her young and settled in. My laughter interrupted the peace and silence and echoed against the canyon walls as Kilchis shook his fur dry. He did not see the humor in it. Not one bit. I flipped back my hood and decided to join Kilchis in a full celebration of rain. Who cares if my hair is wet? By the time I made it to the mud room inside our house, I wasn't sure who needed toweling off most. Me? Kilchis? Or perhaps even more, poor Rev, who begged to be petted more than anyone. She didn't get to go this time, as Kilchis needs to heal his injury and can't risk being hurt by rough play. "Poor Rev..." I cooed, as I reach out to 'pretend' dry her. We groomed her hair and she thoroughly enjoyed the experience, forgetting all about a run on the river. I peeled off my wet jeans and tossed them in the dryer, and then turned to dry Kilchis, who waited anxiously for his turn. He has this way of looking so dang pitiful! I left wet footprints from the mud room to the kitchen, as the aroma of fresh coffee drew me in. I pour some, hit the carpet, turn left into my office and turn on a little music. It's Sunday, and Sundays last forever. You know... That's OK by me. It was bound to hit. Pete reminded me that I've been overdoing it for a long time. Last night, for the first time since I was a child, I had the 'whole works' migraine. Ever had one? Yish. My stomach began to turn and churn. I went upstairs to lie in bed and all of the sudden my eyesight went wacky. It's the weirdest sensation. If I were a wild hippy in the 60's I'd probably think it was neat-o! It's almost like hallucinating. Wild, crazy patterns in my eye sockets that seem to zing through to my brain and superimpose on the wall. Wow. Cosmic, dude! I just thought of something-- During my surgery and for months afterwards, I had an imprint stuck in my brain of a sideways Christmas tree. I guess this happens, when you have a bunch of morphine like I did. The night I had my emergency aortic dissection, I was wearing a big shiny Christmas tree pin. Anyhow, with all of the morphine I was on, it became embedded in my brain, I guess. For months afterwards, I had that Christmas tree shape stuck in my eyesight as a shadow. Anyhow, that is gone, now! Yay! OK, back to the migraine.. The nausea was powerful. Then, the headache hit. It's not at all like a normal headache. I could hear my brain crack! I remember the first time my poor son, Andrew had one. He came home from school absolutely screaming, and buried his head in the couch. I took him to ER I was so freaked out. I should have known it was a migraine. Luckily, I had some medicine that knocked me out. I woke up this morning and I still have a bit of a headache, but thank God no nausea! I'm going to live! That's a good thing, because last night I didn't want to live at all! Migraines are somewhat like sea sickness. It's so bad that your will to live just leaves you. So, if I ever get a migraine when I'm out at sea, and I'm the captain, someone else better take over! LOL! OK, it's off to the races. Last night was my bodies reminder to take it easy. I keep dreaming of getting off of disability and becoming a real person, again. I want to, so badly! It seems like right when I decide to try it, something like this happens, and it flattens me on my back and drops my will to fight a notch or two. Well, this is not going to stop my dreams! I'm going to Vocational Rehabilitation, and they are supporting me in this decision. First, I'm going to try to get my eye fixed. I have an appointment tomorrow. That will be step one in trying to put Humpty Dumpty back together again. "All of Jen's Doctors again and again, tried to put Jennie together again!" I'm cheering them on! I'm doing my part! One down! Wahooo! It's a groovy Tuesday! Marmot Dam clears the way for salmon spawning! Let's party! Watch it live, on KATU! I'm off to the doc, early this morning. Wish me luck. I may have surgery as early as next week. We'll see what the good Dr. Mathers has to say. It may be a tag team operation with two docs. I want my eyesight back. Humpty Dumpty is sewed together again! I'm toast. Totally exhausted! I'd ask for life to slow down a bit, but I am too afraid to do that. I really have to watch out what I pray for! I prayed that ifish would do well. It really did! If I asked for life to slow down, it would most probably stop, altogether! So, you'll see me in the back of the parade, trying to keep up, waving a flag with one hand, and wiping my brow with the other. And... I'll be smiling, despite the sweat! May I please lay down, now? Today I got to thinking about a day- a year or more back, when Pete dropped me off at the Casey Eye Clinic for surgery. It was early in the morning, and I hadn't had anything to eat nor drink. (As required before surgery.) Therefore, I was weak and wobbly and a little bit emotional. It was cold out, and the sky was a light powder blue. I stood there in the parking garage while the cold wind blew my hair. The wheels of his truck crackled on the cold cement as he pulled away. I was there, alone. I was going to walk in to have surgery, alone. Everything echoed until I finally made my feet move towards the door of the hospital. Lucky. When I got to the desk, they whisked me right in. There was no waiting in the office. No time to think about being alone. They kept me busy, and before too long, I was asleep and being worked on. I woke to Bill, stroking my hair. There is a song called, "Sometimes I feel like a Motherless Child". It's a spiritual and we used to perform it, when I was traveling with an opera singer. That song echoed in my mind, that day. My Mom's song, in times of trouble, was "God will take care of me." Figures. That's my Mom for ya! She was so cheerful. So positive. So strong. There were times, though, that I could tell that the cancer scared her. "This isn't how I planned to spend my golden years..." She'd say. When we'd visit in the last days, her body was as thin as a rail and her stomach was all poofed out. I felt so awful for her. She told me earlier on in the illness, that at least for once she'd be skinny, and get to wear fashionable clothing. But, the darn cancer ruined that plan, too. The swelling in her stomach would have been great for modeling maternity wear, not the designer clothes she dreamed of. I could almost hear the thoughts swim around in her head, as the morphine pulled and jumbled them around. I read cards to her that people had written. "How nice..." She'd mumble after I finished one, and then, "Look at my arm. It looks like an old oak tree." She stared up at her arm, held vertical away from her. Thin as a stick, the twisted, gnarled veins knotted and twisting like a vine. They still pumped blood as she'd weakly sing, "Mares eat oats and does eat oats..."
I turned the other way so she wouldn't see my tears. My Mother wouldn't let on to her Mother that she was terribly ill, until Grandma passed away. A month after she died, Mom let go of the pain, and drifted off to Heaven to be with her Mother. My Mother was kind and generous and thoughtful to her dying day. Too much so, I thought, at times. I often wonder if her ceaseless effort to make happiness for others contributed to her cancer, her illness. She couldn't even let Grandma know that she was ill. She'd dress up nice and go visit her, and do for her, and never let on about the cancer, even though she was losing huge amounts of weight, and did not look healthy. "There's nothing worse that a parent losing a child. It's not natural." I remember her telling me that early on in my life, so I knew what she was thinking. She couldn't have that happen to her Mom. She was far too kind to hurt her. I can even go to surgery by myself. I've done that before, too! Somehow, I'm more at "God will take care of me" than feeling like a Motherless Child. I guess when you have an aortic aneurysm and you know that your life can flutter away at any moment, you pretty much have to stand alone and think that God will take care of you. No sense at all in being scared. I don't have to worry about passing before my Mother goes. I guess I'm lucky, that way. In my life, if the "worst" were to happen, I'd get to go to heaven to be with my Mom! And then, I'd not be feeling like a Motherless Child, at all! I really have nothing to be afraid of, I've decided. I can go to surgery alone. But still.... even though I'm 47... There are times when I want nothing more than to sit in the lap of my own Mother. I want to feel her soft skin and smell the smells that she was. Fresh cinnamon rolls or summer jellies. Green beans being cut up on the patio on a warm summer day, or a fattening but oh-so-good casserole on a cold winter evening... My Mom was all of those things, and as I breathe in right now... I swear she must be here. The aroma of everything she was surrounds me. I try with my entire being to be like my Mom for the benefit of my own kids. I want them to remember me for the food that I cook, and the traditions that I learned from my own Mother. I want to gather it up and pass it around, before the kids leave home. Can I do it all? Share it all? Run, Jennie, hurry! You know, I have so much to do. I've started to write a list and it gotten so big that I decided that my job for today is to do just that one thing. Bill hollered into my bedroom this morning, "Want to go fishing on Friday?" I freaked. "Bill! I can't fish on Friday! I've been gone from ifish for a long time, and I have no idea how to catch up on it!" Even writing a to-do list is hard, because my mind is swimming with thoughts of my Mother, and thoughts of yet another eye surgery, September 6th, and ifishstock, and how to do it all with a body that doesn't want to do anything. My muscles hurt. I've had migraines daily for the last week. I've totally lost the vision in that eye that I was so hopeful about at one time. The good surgeon, Dr. Mathers, will attempt to take my anterior chamber lens out, that was put in years ago.. because it's too small and it's jiggling around, damaging my cornea. I have bubbles of edema on that eye. Ewe! If all goes well, then they'll replace that lens with a posterior lens. (Behind the iris). The last surgeon to work on that eye said the tissue fell apart in his hands. We don't want that to happen! If all still goes well, then he's going to try to close my pupil that is mishapen due to a problem last surgery. Wow. That sounds like a lot to me! To top it off, after that surgery, if my cornea does not heal, they'll want to do an endothelial cornea transplant. I just hope that my aneurysm holds out through all of this. So, all of this is on my mind, and I can't seem to get anything done! I'm writing this, procrastinating doing anything! But as I sit here staring out at a blue sunny day, I'm nearly watching the green grass of summer fading to a golden brown. A maple leaf gently twirls and floats in the air past me. Life is so fleeting. Where is summer going? And is it already 4:00 PM? Oh, no! Thank goodness Bill and Glenda Monroe just called and asked us to dinner. Now I won't have to cook! In just this one column, though, my thinking has come full circle in my stressing/worrying/to much to do/ frame of mind, and I realized that yes, I am a Motherless child, but God will take care of me. See? I can do both songs! Now... help me write this list... I'll get caught up on ifish, somehow. It's the "That's hot!" column, which, if I remember correctly, will come out on the front page in this column, on Fridays. "That's hot" will be a culmination of what is hot (No, it's not about Paris Hilton!) on the board, and out fishing. At least, by what I've heard on ifish! This way, if you are a casual reader of ifish, you can just simply click on the "What's hot" on Friday, and catch up. Warning: You might just get sucked in and post on ifish! And for further warnings, please see the ifish disclaimer! First thread that comes to mind is the new Nehalem Park debate. People are hot on this one, this week. The locals are being accused of being selfish, wanting to keep the beauty of their land, to themselves. I hear say one guy wanted to keep the public "west of 101". Bill got involved early on trying to do good. He was wanting an improvement for fishermen at the beaver slide launch site, in memory of Jim Erickson. He followed up, after speaking privately to the folks in charge, by attending this meeting in Manzanita. He came away shaking his head, saying he was "resentful" towards the community for the anger and hostility displayed at the community meeting. For gosh sakes, the mayor used the "f" word! See the discussion, here. Clean (cark) a tuna with an electric knife! Gator fishing with Kevin Newell! LNG and the Columbia. Look out! Ya gotta be quick on these issues. Sometimes great info is posted, but has to be deleted due to content that breaks our acceptable use policy... such as name calling, personal remarks, etc. So, stay on top of things or you just might miss the drama! These are hot topics... some of them fun, some very controversial and most to all of them, FISHING! fishing report for ifish's week of July 27th! It wasn't a dream. It happened last night, and I wrote about it on the board. Please read the following! I'm still pinching myself! "I'm so excited I can barely type! When I caught my 21 inch cutt, Bill said it was the cutt of a lifetime. Well, maybe... but I've come close in the last three years! I caught one 19" a couple years back and tonight, and 18". I caught it on a big spruce fly. I have been doing so well on that fly! Anyhow, I got it in a Christmas card from a friend. I hope I never lose that fly! OK, so I'm cooking dinner and I just had to go to the river. I 'set it and forgot it' and left Bill with instructions. The potatoes... yadayada, the blueberry crunch bread, yadayada... the steak on the Traeger, (more yada...) and left! Out the door she flew with Kilchis and Revvie by her side! Since the rain, there has been some nice cutts, so this is one time I didn't lay my rod down and enjoy the scenery. I was there to FISH! I cast and cast... It seems like, though, if you cast up into the riffles and let it play down into the pool, it really helps. Like way up in the riffle! So, I did. So, I tried this one last daring cast under the shade of a tree. This isn't the oak tree hole, though... A different tree. Dang. Into the tree I went. I knew it was risky! Jim Erickson taught me this neat wiggle trick to get lures/flies out of brush. The line was sweeping in a "J" with the current. I picked that up and held it in the air and gave it the Erickson twitch. Sure enough, it tickled out of the tree and down into the........ SPA----LOOSH! Rev had split somewhere, but Kilchis was watching. I kept saying, "Kilchy... this is a BIG one! Kilchy! I got a BIG one!!!!" We laughed. Then, I saw this golden color... I thought... what the??? But, it was just a big resident cutthroat with big, deep dark spots all over her! Finally, Bill measured it at 18 inches! and eats it all just like a man! I'm HUNGRY! ...and I love that blueberry bread I make! 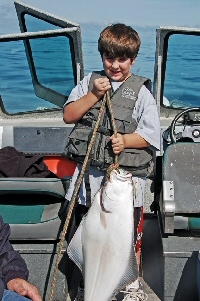 Catching fish like that sure is good for the appetite!"